I have a new obsession, chocolate lollipop molds. Ever since I made the cake-‘stache pops, I can’t stop thinking about all the different cakepops I can make with chocolate molds. Just recently Bake it Pretty had a sale on their candy molds. They were selling them for 50% off. I had to pinch myself to make sure I wasn’t dreaming up this sale. Of course, with the molds being half off I bought triple the amount of things I originally was going to buy. Makes sense, right?!? 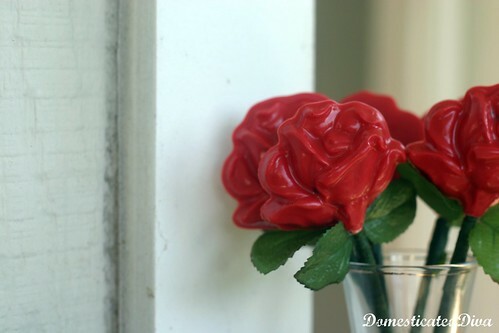 One of the molds I purchased was a rose mold and I immediately came up with an idea for them. To make it look more like a rose I wrapped green floral tape and placed leaves on the lollipop stick. 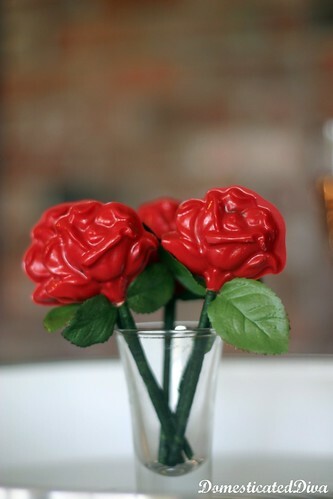 It reminded me of the Hershey Kiss Roses we made for my wedding favors 7 years ago. It’s amazing what a little floral tape and artificial leaves can do! 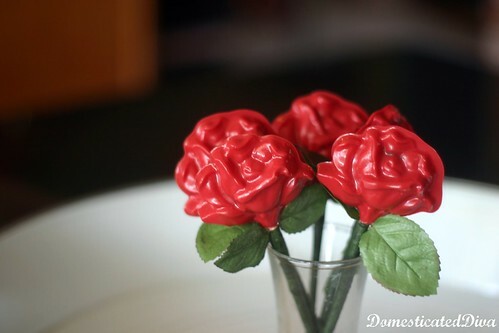 Fill the chocolate rose mold quarter to half of the way with my melted chocolate candy melts. 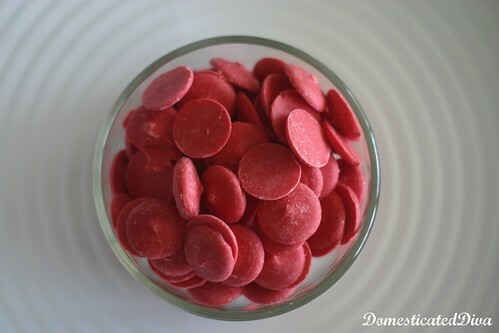 Make sure to slightly tap the mold on the counter to get all the air bubbles out of the chocolate and to spread the chocolate evenly in the mold. Next, I took my cakepop mix (crumbled cake and frosting) and shaped it to fit in the mold and gently pressing down on it to make the chocolate go up the sides of the mold. With the mold being uneven and detailed, pressing down too hard on the cake mix will result in the cake showing through on the fron, so be gentle. Make sure that the cake mixture does not over fill the mold or the back of the mustache will look bumpy. I placed a lollipop stick in the mold and filled the rest of the mold with my melted candy. Don’t forget to slightly tap the mold on the counter, again. Once all the molds are filled place them in the fridge for about 10 minutes to set. When the roses have set, remove them from the mold. Take green floral tape and going around the lollipop stick carefully wrap the tape around. Once the floral tape has been wrapped cut artificial leaves to fit, place it on the stick and using the floral tape secure the leaves into place.